This digital audio switcher provides an easy solution for users who need multiple digital audio sources to sound system with limited audio input. This compact switching system helps expand your existing receiver or amplifier with 4 digital audio input capacity. And it provides reliable and accurate digital audio signal transmission without any loss. Simple switching rather than disconnecting and reconnecting cables when optical inputs are limited from the existing receivers or mixers. This 4 In 1 Out digital audio toslink switch is compact, lightweight and easy to install. 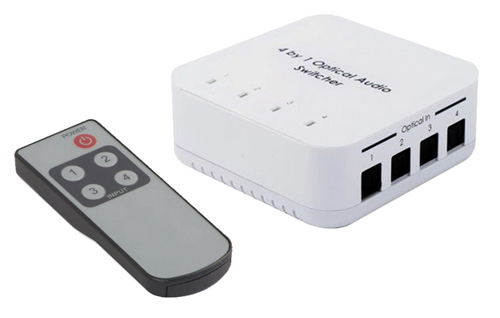 This digital optical audio switch also prevents the wear and tear on your Toslink cables and input/output jacks from repeatedly disconnecting/reconnecting devices. Easy audio input switching by using the front panel push button or using the supplied IR remote. 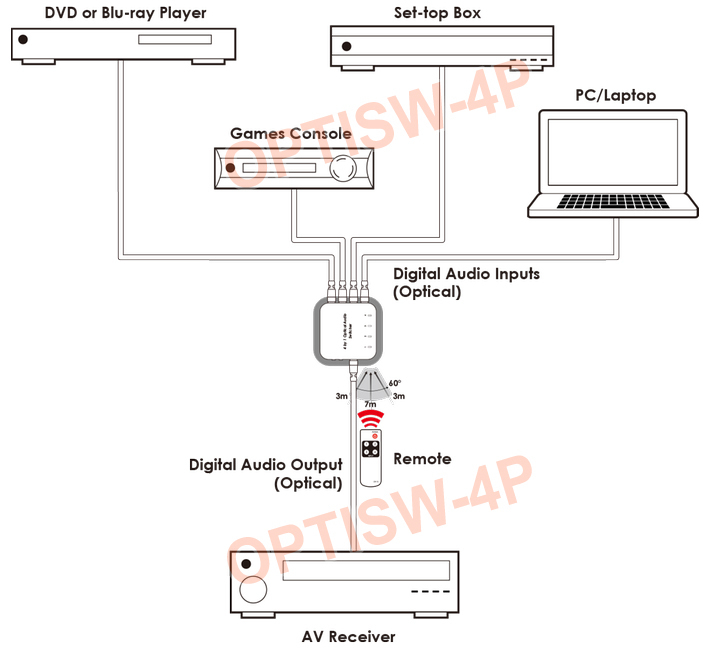 Up to 4 optical audio sources can be connected together at the same time with home theater receiver or amplifier. with the help of this optical audio switcher. This digital audio switcher supports all S/PDIF standards including compressed multi-channel Dolby 5.1, Dolby Digital, AC-3, DTS as well as uncompressed LPCM/PCM audio formats. This digital audio switcher can support various optical sampling rates at 32, 44.1, 48, 96 kHz and up to 192kHz at 24-bit resolution, covering most standard digital audio equipment. This optical switch will remain staying at the last input selected after power-on or power outage. 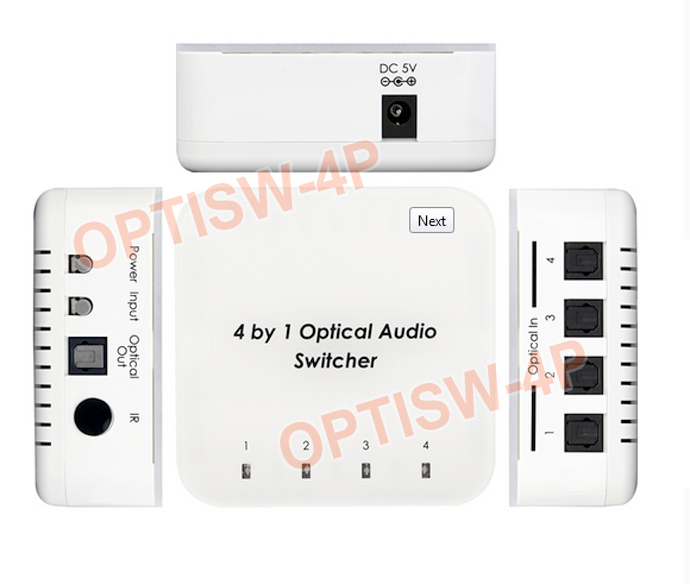 Premium digital audio switcher with 4 optical toslink inputs and 1 optical audio output. Easy expanding digital audio inputs for existing home theater receivers and amplifiers. Supports uncompressed 2-channe PCM and multi-channel LPCM digital audio signal inputs/output. Supports compressed 2-channel and multi-channel Dolby and DTS audio inputs/output. Supports various sampling rates at 32, 44.1, 48, 96 kHz and up to 192 kHz max. Supports various bit resolution up to 24-bit. Provides crystal clear sound passage and electromagnetic-noise-free transmission. Maintains the signal integrity during transmission without any interference and distortion. Handy audio device recommended for home and professional audio switching systems, audio recorders, mixers, etc. 5V DC power supply included.